Just a couple months ago, I was invited to join the SoftBums Ambassador Club and give these cloth diapers a try. I had seen them advertised for quite awhile across social media and I became a fan of their prints really easily. I also was very curious about how they would fit, and since I am accustomed to snaps, I was hesitant to try hook and loop. SoftBums have a very unique toggle system that looks intimidating, which I think is why it took me so long to jump on board. But once I put the very first SoftBums diaper on my baby, I was HOOKED! 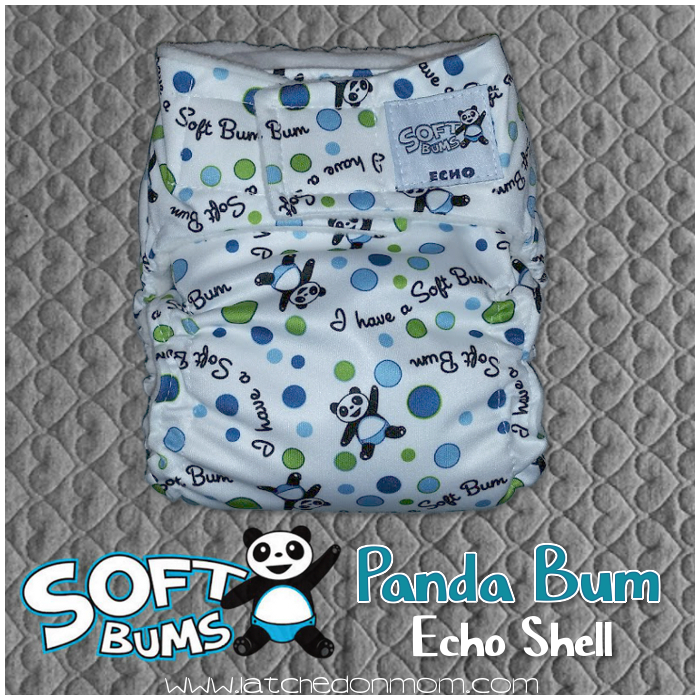 The first one I tried was an Echo shell in the Panda Bum print and will be the model diaper for this review. 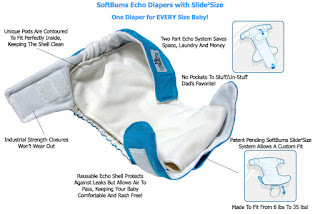 I will tell you about the SoftBums company, how the Echo diaper works, how the Omni diaper works (the other style SoftBums offers), and sharing everything I have experienced so far in my SoftBums journey, plus some super adorable pics of my littlest one showing off her fluffy bum! 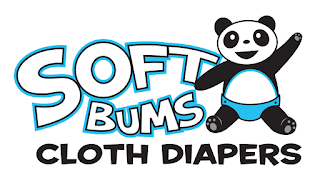 The diaper used in this review was provided as part of the SoftBums Ambassador program, I was not compensated in any way for sharing my opinion here on my blog. 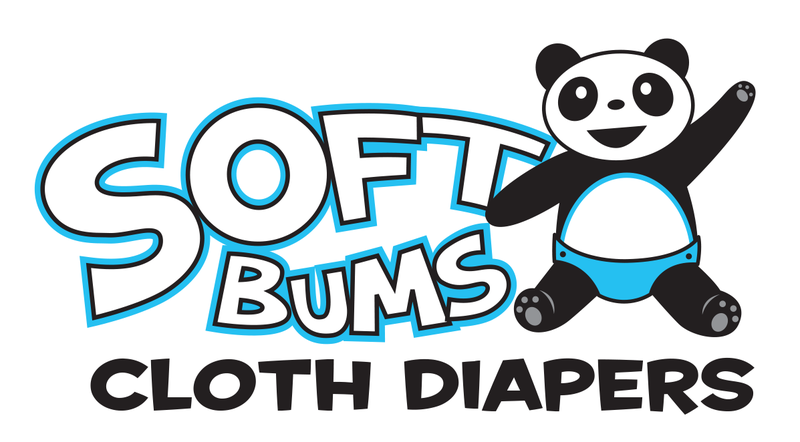 SoftBums is a cloth diaper company that is in Minnesota, founded by Sarah Van Bogart. 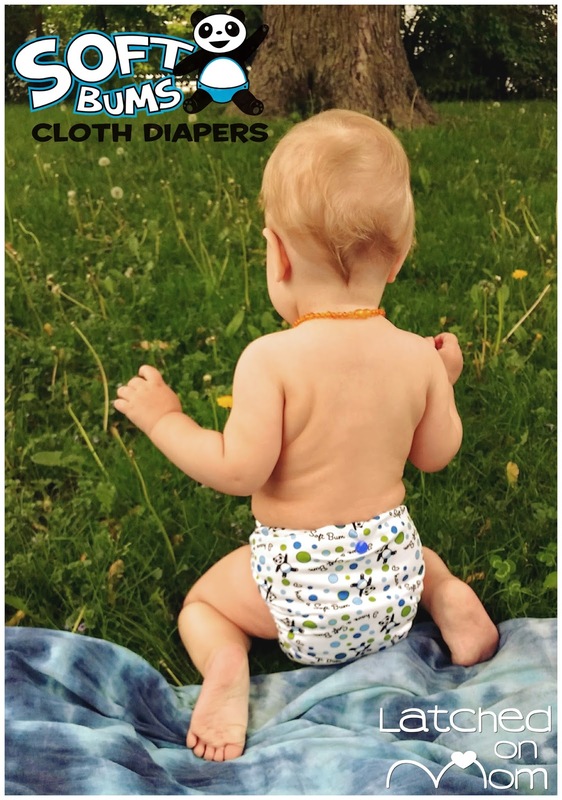 She was inspired to design a cloth diaper that truly fit from newborn to potty-training, after seeing her friend being unsuccessful with cloth diapering. She wanted to make using cloth as easy as possible, as well as affordable. With the help of her husband, the patented Slide2Size system was developed and implemented into the design, creating the perfect one-size-fits-all cloth diaper. The diaper shells are "made with the best industrial materials we can source, and proudly made in the USA." The SoftBums pods (inserts) are made ethically and lovingly in China. 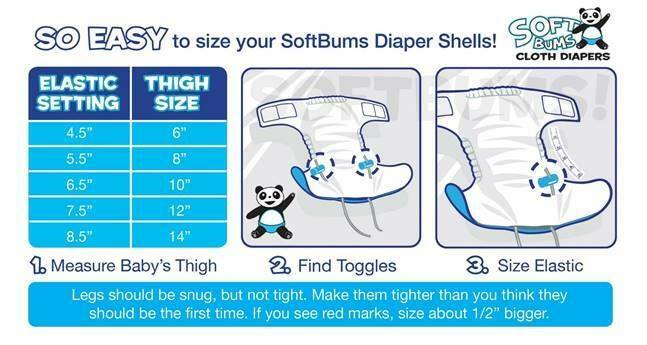 There are two different styles of diaper shells that SoftBums makes. The Echo and the Omni. Some prints are available only in one style. 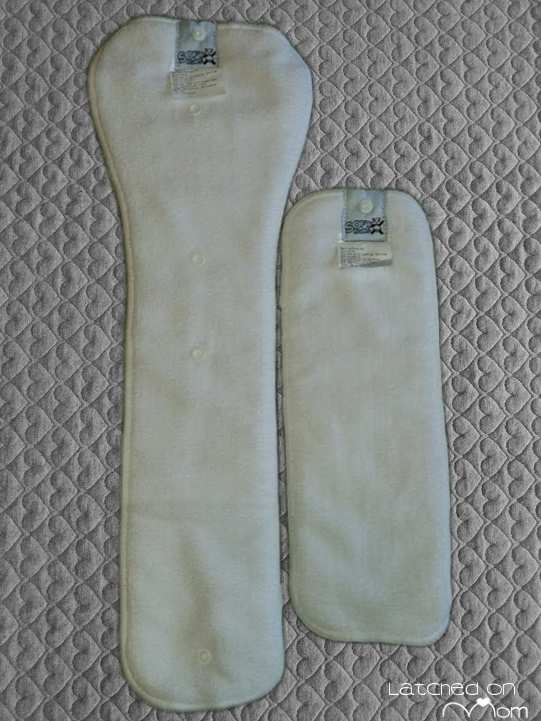 Both styles offer the unique Slide2Size system to create a custom fit to your baby. They are a 2-step diaper, otherwise known as an All-In-Two (AI2). The inserts are called Pods and they snap right in and the diaper is ready to wear. 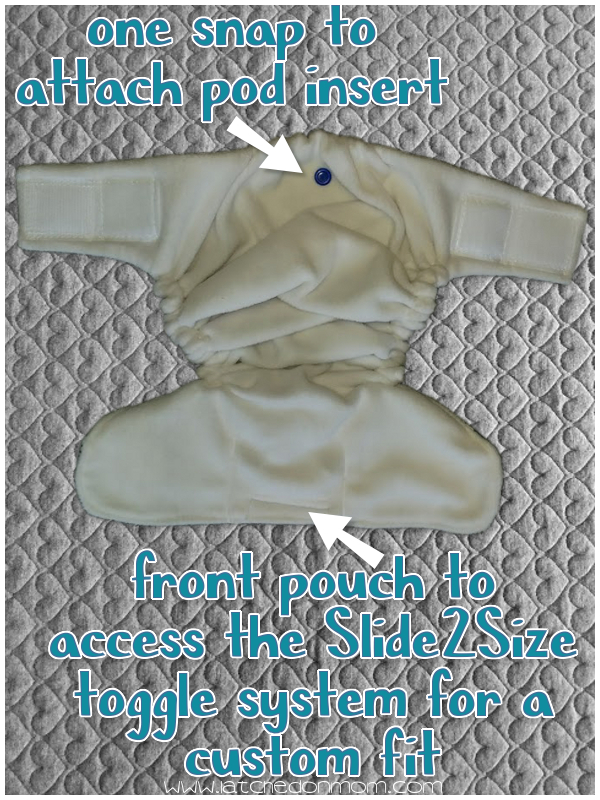 Because of the Slide2Size system, they are designed to fit babies between 6-35 pounds! I have not tried any other diaper that offers such a wide range! The newest print, Anything Is Possible is available in both Echo and Omni! This is such a cute print, with 3 little flying piggies on it. I made a video sharing how to get the perfect fit that may be helpful for you. Basically all you do is pull out the measuring tape and measure around the thigh. You take that measurement and follow the chart above. My daughter is at about 11 inches, and the chart suggests to adjust the elastic to around 7 inches. 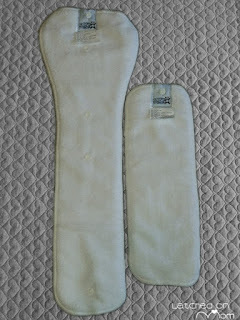 Then just reach inside the front pouch to access the Slide2Size toggle system, pinch the toggle and pull the elastic. Next, measure the diaper to make sure it is at the right measurement. You want it snug, and maybe even a little tighter the first time. If it leaves marks, give it a little slack. Fitting this diaper just right is super easy! 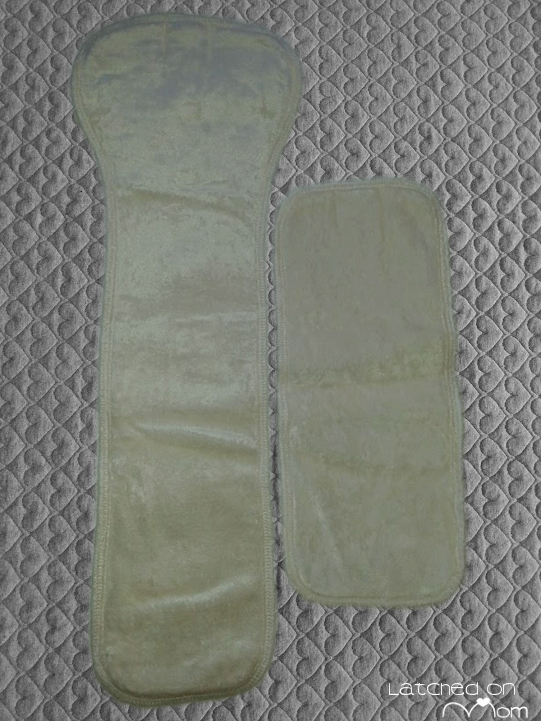 The inside of the diaper shell is composed of a cloudy soft microfleece fabric. It is so pillowy soft and comfy next to baby's skin. The outside of the shell is made of PUL (polyurethane laminate) which is waterproof. There is one plastic snap at the top inner backside to attach the pod insert of your choice. SoftBums has several choices to assist you in getting the best absorbency. 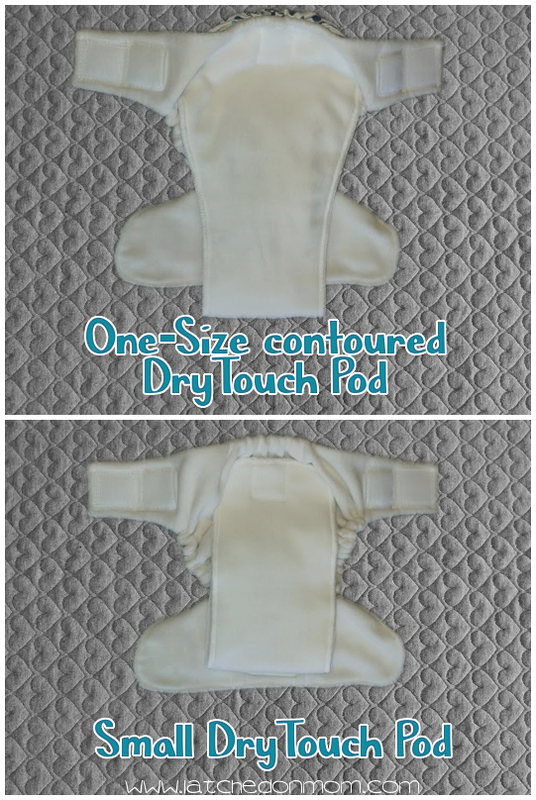 There is the One-Size DryTouch contoured Super Pod that has 3 rise snaps to change it from a small setting to a medium and also to a large setting. 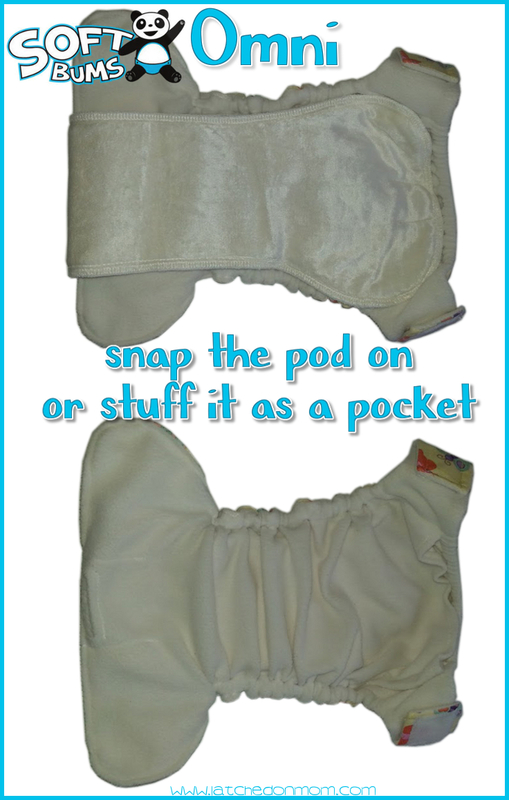 The top of this pod is faced with a DryTouch fleece to wick moisture away and has 3 layers of thirsty microfiber. The Small DryTouch Mini Pod can be used alone or with the One-Size countoured Super Pod, it snaps right on to the top snap. The Mini Pod insert has the same top layer as the One-Size DryTouch Super Pod insert and also has 3 layers of microfiber. Adding these together is great for overnight or extended diaper wear. The One-Size Super Bamboo Double-Pod is made from all-natural bamboo grown without pesticides or fertilizers and is an excellent alternative if you're looking into more natural fibers. It comes with both a One-Size bamboo Pod and a bamboo Mini Pod. These inserts have such a velvety feel, you can tell the quality is exceptional! They have been pre-washed so they're ready to get to work keeping baby dry right away, without prepping! Below, I show the Panda Bum Echo shell in a very small size setting with the One-Size DryTouch at the top of the photo. As you can see, it is a bit large for this small setting. The Small DryTouch Mini Pod is best for this setting (bottom of photo). 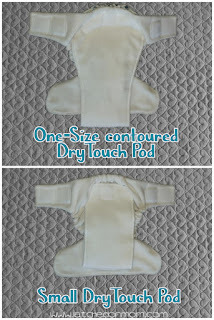 I would recommend that you use the Small DryTouch with a newborn, but as baby grows, the One-Size DryTouch will grow with them! When you can't use one of the Pods, you can always lay a prefold, flat or flour sack towel in. And if you're looking for a disposable bamboo insert, the H-Pod is also available! So far, all the SoftBums shells I've tried have been hook & loop- AKA Velcro. It is very sturdy, and places very well where you attach . There are laundry tabs to bend the hook & loop in and attach itself to the inside of the diaper that will keep it from snagging in the wash. Above is a photo of my 12 month old in the Panda Bum Echo diaper with BOTH DryTouch Pods added in. I wanted to show you that even with both of them added, it still is not huge and bulky. Here are a couple photos of my little one in just the One-Size DryTouch Pod playing outside. It is a very trim diaper, with just the One-Size DryTouch Pod, it will easily go through 2 hours of wear. 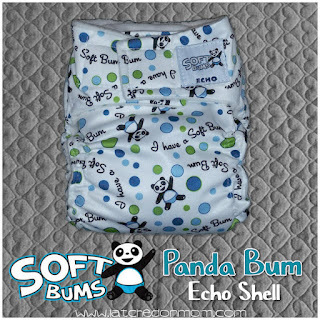 SoftBums says that these diaper shells can be rotated throughout the day. 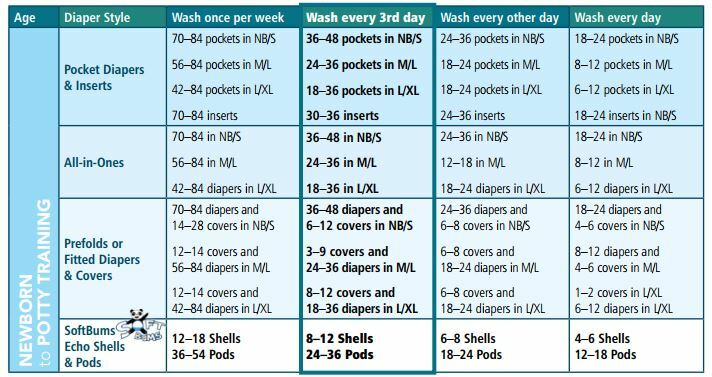 My daughter isn't a super heavy wetter, so we've been able to cycle them out because the shells are not usually damp with pee after use. We can go through about 3 a day. With frequent changes, you can use less shells per day. So, you may be wondering then, how many SoftBums diapers do I need? Here's a helpful chart! 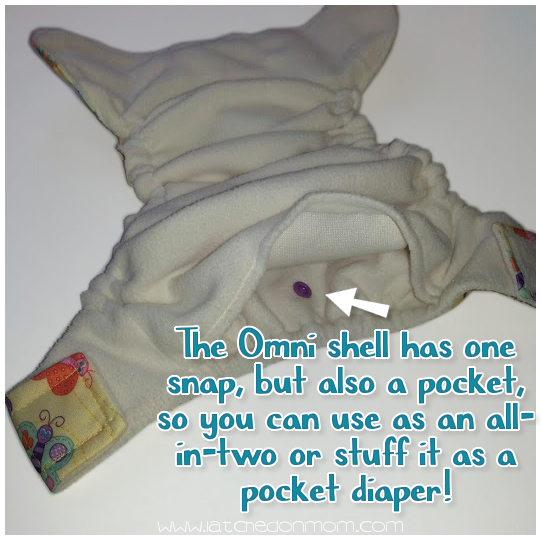 The Omni shell is different because it has a pocket, but it also has a snap conveniently placed to snap in a Pod. Because of the pocket feature, you can stuff this diaper, if you prefer. You can also stuff with extra absorbency and add your Pod of choice on top. It is also slightly wider in the middle. I prefer the One-Size Super Bamboo Double Pod stuffed AND snapped into the pocket in the Omni. Below is my Instagram post of my little sweetie in the Flutterby Omni! Tromping around outside in the Flutterby Omni by @softbums today! Love the custom fit these diapers give & the adorable prints 💗 can't wait to see what the next cute print will be!! One more cool thing about SoftBums is that there is a warranty for new diapers bought directly from SoftBums or another licensed retailer with proof of purchase that fully covers manufacturing defects like toggle issues, PUL delamination, snaps and elastic dysfunction. You can read more about the warranty HERE. I love seeing companies make sure customers get to enjoy their products to the fullest! What's my favorite thing about SoftBums Cloth Diapers? These diapers offer such a terrific fit and I have yet to find anything else with such a unique size range. Is there anything I'd change about these diapers? I don't have anything I'd change about these, but I would like to see more products from SoftBums, like a wipeable cover and potty training pants! I give SoftBums Cloth Diapers a 10/10! 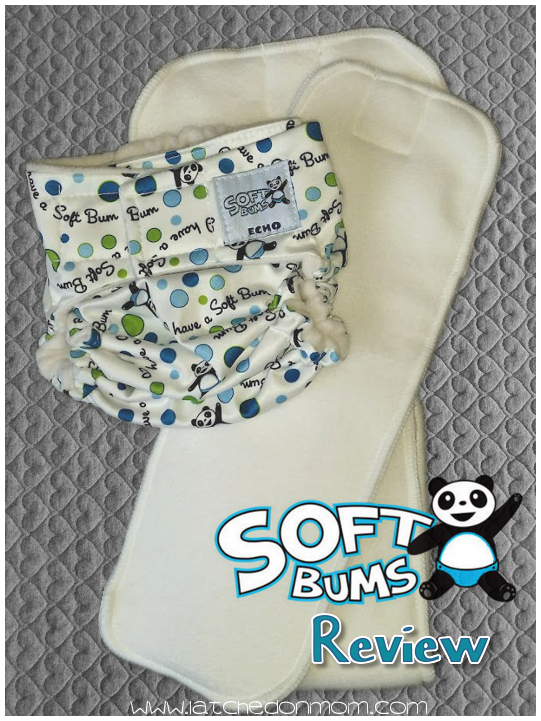 You can purchase SoftBums directly from the website, shop my favorite online retailer The Green Nursery, or on Amazon! Be sure to LIKE SoftBums on Facebook & Follow on Instagram! I know you want to keep up with all the new products, giveaways and special offers! I love the slide2size system. Frankly it's pretty genius!!! I love that it can switch so easily from newborn to toddler. It's especially useful for people who are unable to snap snaps! I like the idea of not having rise snaps, because it seems like LO is always in between the rise settings. The toggle system sounds like it would give you a perfect fit! I have the same situation with my little one, plus they're always unsnapping! Seems like softbums is kind of like fuzzi bunz in their sizing. I like their cute prints. Not quite because there's levels to adjust to with Fuzzibunz, whereas SoftBums goes in between! I really like the toggle system and the different ways of stuffing the diaper. I love the slide2size system. I love the idea of the slide2size. I've never used this, I am used to different rise settings but I am definitely wanting to try this. 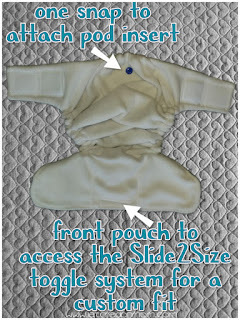 I like the slide2size feature - I don't have this option on any diapers I have on hand now. Oh the slide2size feature intrigues me I have never seen this before! I love that you can snap the insert on and go or use it as a pocket diaper. I love having options! 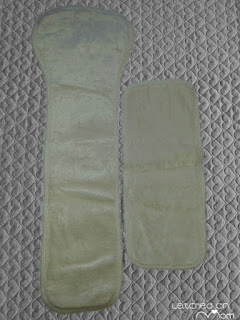 The sliding elastic is fantastic, it looks like it eliminates bulkiness in the front of the diaper. Great review, thanks! I like how you can stuff the pad or snap it on! This print is really cute too. My favorite feature is that they don't have any rise snaps! It makes them fool proof for childcare and the church nursery! I'm intrigued by the slide to size system. I also like that there are options for natural fibers to use in the Ai2 system. I love the sliding size system. I'm always having issues with my snaps coming undone. I like the sizing system and the adorable print choices. I love the idea of the Slide2Size system. I like that they are made in the USA. I also like the 2 snap pod system. 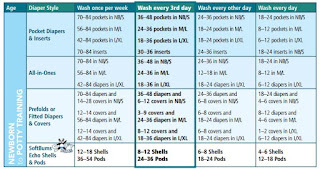 I have been using cloth diapers for a total of about 5 years now and am having baby #3 in the next month. I have always wanted to try softbums, I have heard such great things about them. I love the idea of the Slide2Size system to get a custom fit! Love these diapers! They fit my son from birth really well and just keep getting better! I love the slide sizing! I love that they have a snap to keep the inserts from sliding around. Looking forward to trying these! I love that the Omni shell has a pocket so that you have the option of stuffing it with an insert or using one of their snap in inserts! I love how the pods snap right into the diaper! I've never had a diaper with Velcro I would love to see how that is. I'm new to cds but am very excited to learn! I love the slide2size system! It's pretty awesome to have a diaper that truly fits from birth to toddler and this diaper delivers! I really like the slide to size! I love their prints and that they are made in the USA. I haven't used this brand, but I've used other diapers with adjustable elastic for the rise. Overall, I'd say the style of diaper is really good for skinny or chubby legs vs in proportion legs because it's completely independent of the waist closure. I love the sizeable elastics! Soft bums are amazing! I like the slide2size feature. It seems like a great idea! I love the toggle system!! No rise snaps all over the front of the diaper!! I love the slide2size system! We love that it fits newborn -through ... well, my preschooler can still wear them. I love the wide range in sizes this diaper offers! I love their size adjustment system. Way easier than most other brands. The toggles are the best part! I love the adjustable elastics, the super soft fabric, and the adorable prints! I like that they are USA made and the snap in pod system. I love the slide 2 size toggles! Plus the elastic is super easy for me to replace! The strong, durable hook and loop is a great feature!